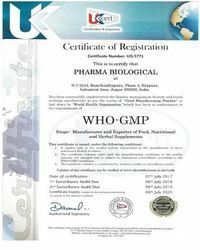 Established in 2014, we, "Pinkcity Pharmaceuticals" a leading Manufacturer and Trading of Pharmaceutical and Nutraceutical Syrup, Pharmaceutical and Nutraceutical Capsule, Pharmaceutical and Nutraceutical Tablet, Ayurvedic and Herbal Health Supplements, Protein Powder, Multivitamin, Calcium, Iron Capsules and Syrup, Vitamin Supplements, Fitness Supplements, Tablets, Sachets, Glucose Powder, Derma and Hair, Whey Protein, Dietary Supplements, Ayucharge Chocolate Powder, etc. Under the direction of our mentor “Devendra Arya” we have successfully expanded our business in market. We are the leading organization in this domain, offering excellent quality products to our precious clients. Leveraging upon well-installed and ultra-modern infrastructural facilities, we have been able to deliver supreme grade products to our precious customers. This infrastructural unit is further alienated into variegated departments which include research & development department, procurement department, quality control department and warehousing & packaging department. In order to manage these segregated departments in a well-organized manner, we have selected a team of adroit professionals. MAX CARE DRUGS PVT LTD.
BROWN AND BLACK BIO PVT LTD.